Tag Archive | "Henry Wadsworth Longfellow"
No doubt you have heard or read the opening lines of Henry Wadsworth Longfellow’s famous poem concerning one of our most colorful heroes of the Revolutionary War. Equally high is the probability that you are not familiar with the entire story of Paul Revere, or that of his brave compatriots. We are about to rectify this, in order to clarify the contributions of those who helped to forge the United States of America. Born on December 22, 1734 in Boston, Massachusetts, our hero entered the world as the son of a French Huguenot immigrant, Apollo Rivoire, and a Bostonian mother, Deborah Hichborn. Apollo, who became a journeyman silversmith, Anglicized the family name to “Revere” and passed his craft on to his sons. Upon Apollo’s death, Deborah assumed management of the business and their sons, including Paul, performed the actual silver work. Paul grew up to serve as a Second Lieutenant in an artillery regiment, seeing action in our dawning nation’s French and Indian Wars. After separating from the army, Paul returned to his hometown, where he became a prominent and prosperous silversmith as well as a member of the secret society of Freemasons. He settled in North Square, married Sarah Orne, and with her, had six children. During this time, Paul became actively involved in a political group named The Sons of Liberty. England, which viewed the budding America possessively as colonies under her rule, levied taxes while denying the colonists a voice in Parliament. Some of those who disagreed with this “under my thumb” approach formed the Sons of Liberty. If you can imagine a latter-day Greenpeace, you’ll have a notion as to how this organization got its point across. They destroyed the symbols of the English gentry, spoke out vocally against the British Crown, and generally became a thorn in England’s side. Dr. Joseph Warren was a member of this activist group, and became Paul’s friend. After this original Tea Party in 1773, Paul served as a messenger for the Boston Committee of Public Safety. In this capacity, he ferried messages to supporters in New York and Philadelphia concerning the political unrest in Boston. In 1774, the British had had enough of The Sons of Liberty and their brand of insurgence. They closed the port of Boston and began to house great numbers of soldiers, nicknamed “The Regulars,” around the city. In 1775, Dr. Warren dispatched Revere to ride to Lexington, Massachusetts, to warn Samuel Adams and John Hancock that the British were coming to arrest them for their part in fomenting the colonies’ independence from England. 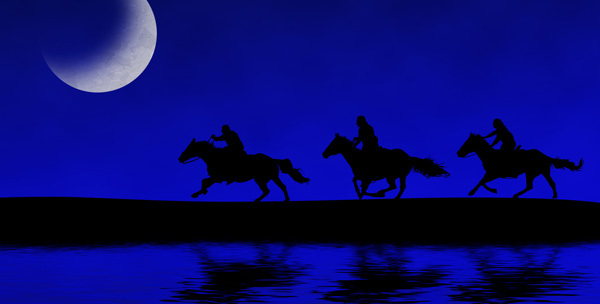 Arriving in Lexington at midnight, Revere helped our two forefathers to escape arrest. Paul’s fellows then rowed him across the Charles River to the city of Charleston. Here, Paul had already made a connection with the sympathetic deacon of Old North Church in Boston. Upon word from Revere, the deacon was to hang one or two lanterns in the bell tower of the church to warn of the advancement of the British militia upon Lexington (“One if by land and two if by sea”). When Paul arrived with word, the deacon made good on his, thereby warning the surrounding countryside of the British invasion. At this point, another rider, William (Billy) Dawes appeared on the scene. Charged with the same mission as Paul, he came from a different route as a hedge against capture. Revere and Dawes then decided to ride together to Concord, Massachusetts, where ammunition and guns were stored, in order to spread the alarm further and enable the colonists to take up arms. A third rider, Dr. Samuel Prescott, assisted them. Soon, the courageous trio was arrested by a British patrol. Dawes and Prescott managed to escape, and after a brief interrogation that satisfied The Crown’s troops, Revere was released. He returned to Lexington in time to witness the battle on the Lexington Green, in which the Sons of Liberty and their supporters repelled the British. It’s all about Paul Revere’s and Billy Dawes rides. The Regulars are out, so patriots take heed. They crossed the Charles, went Paul in his boat. His majesty’s boys in Lexington by three. The lesser known of the two heroes today. Through Medford and Metotomy for Adam’s sake. Got captured awhile, then laid low. But the hero broke free and off he fled. “I must make it to Hancock”, is what he said. To tell Adam’s and Hancock they must hide. Standing tall to greet the British scene. To help launch a nation’s maiden flight. The all-night ride of America’s men.